Mercian Hymns is a poem sequence by the late, great English poet Geoffrey Hill. Published in 1971 it imagines the reign of Offa, King of Mercia as not only history and myth but also as the presiding spirit of the modern West Midlands. Hill conflates the past and the present letting them occupy the same poetic space. Something similar is happening in the paintings of David Stone. His compositions reflect knowledge of the great English landscape painters but his subject matter is resolutely 21st century. His technique mimics the surface perfections of Dutch Golden Age genre painting but it also references the distortions and untruths of photography. David says ‘I regard myself as a landscapist, but interpret that as recording the landscape I live in rather than the classic countryside view’. His landscape is north Colchester, the A12, Axial Way. He sees the pastoral and bucolic, but in the scrubby edge of town, the verge on the bypass, bin day on the new housing estate or wasteland waiting to be built over. The 'classic countryside view’ is acknowledged but then lit by the glow of sodium street lights and peopled with cars on a damp ring road. But these paintings go further than overlaying the bucolic gaze with the grubby tidemark of modernity. They ask questions about what we notice and what we pay regard to and they suggest new metaphors. 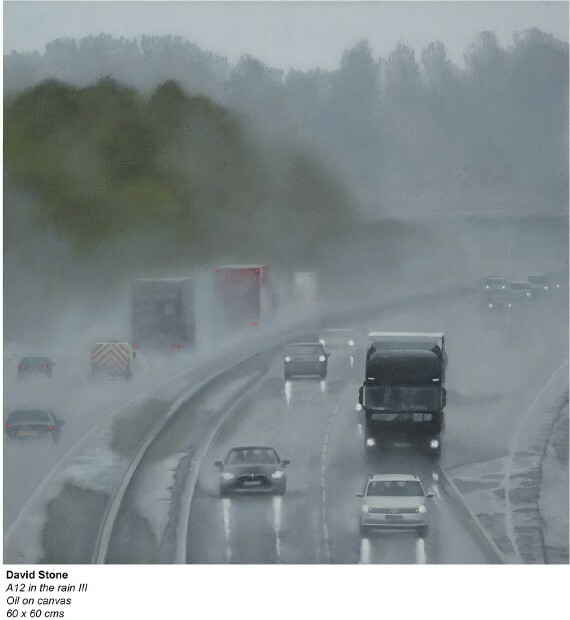 In particular David sees the road not only as apt subject but as a metaphor for something much darker and more intense. Watching the stream of traffic from a damp overpass, wondering what possible reason so many people have to be on the move, the road becomes a metaphor for each of our journeys into the dark, the unknown. In the USA the road is excitement, freedom and poetry but it has never meant the same to us. In the USA there is a romance and filmic quality to standing on a caged freeway bridge in the violet and yellow evening heat, a glow of sky reflecting in the storm drains, traffic streaming north to San Francisco, taillights fading south to Los Angeles; a romance that an over-bridge above the M25 at Dartford or, in David’s case the A12 at Colchester, does not seem to have. As a nation we imagine we are about rootedness, about finding our true home. We imagine our better life, if only we lived in a village. But our modern experience of the landscape is not one of rootedness; it is not so much ‘emotion recollected in tranquility’ as a flickering blur of pylons and field-hedges, road signs and service stations, the flare of headlights, the spray raised by traffic. David takes the stuff of our modern lives and turns it with sensitivity and skill into paintings both deeply resonant and poetic. He reclaims the ordinary and the mundane, the things we don’t like to think about, the things that make up a lot of our everyday life and forges them into powerful metaphors for our inner, perplexing and complex lives.